Makayla Caswell was born in the town of Crowley, Louisiana and is a senior at Iota High School. She is an exemplary student as she is heavily involved in the FFA, the Beta club, and the SNAP club all while maintaining a 3.9 GPA. FFA has been the one organization she has found her passion through. She has held offices in her chapter, area, and now state where she serves as State Parliamentarian as well as secretary for the Iota High FFA Chapter this year. She has also competed in the Milk Quality and Products Career Development Event. Outside of FFA, Makayla enjoys hanging out with her family and watching Netflix! After high school, she plans to attend McNeese State University to major in agricultural education with a concentration in special education. As an agricultural educator, she wants children with special needs to have the opportunity to get involved in hands-on ag shops and FFA activities. Makayla hopes to open the eyes of the public and show them this organization accepts everyone. She also hopes to begin her own middle school chapter because she wants kids in her community to be able to get involved with the FFA sooner because she was unable to. Makayla is super excited to see what the members of Louisiana FFA have in store as she begins her year of service! 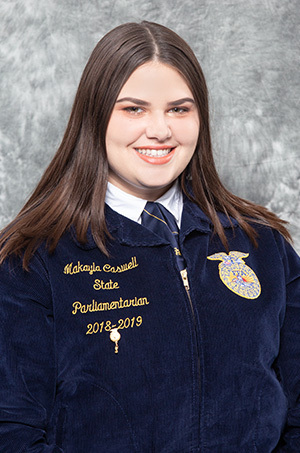 Makayla Caswell is proud to serve as our 2018-2019 State FFA Parliamentarian.